Anne Steward (nee Burton) was born in Knottingley, West Yorkshire on October 3rd, 1951. She is the eighth child and third daughter of Tom Burton and Dortohy Burton (nee Tomlinson). Brothers and sisters are: Tom (deceased), George, Mary Barton (deceased), Harry, John, Joan Harris (deceased) and Arthur. 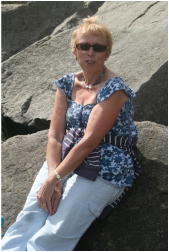 Anne was educated at Pontefract Girls High School and holds a BA degree from the University of East Anglia. She is a retired primary school teacher. She married Peter Owen Steward in Knottingley Parish Church, West Yorkshire, on July 24th, 1972 and the couple have two children - Christopher Owen Steward (born 24th February, 1982) and Matthew David Steward (born 10th January, 1984). They also have a grandson - Elliot Oliver Steward (born 1st September, 2012) and a granddaughter - Poppy Rose Steward (born 6th February 2015).